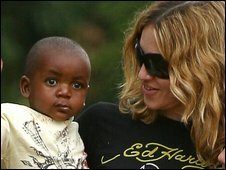 Pop singer Madonna has travelled to Malawi in a bid to adopt a second child from the country. Four-year-old Chifundo "Mercy" James is in the same orphanage that was once home to David Banda, adopted by the singer in 2006. Madonna's decision take a second child has already been criticised by international charities but now a human rights organisation in Malawi is threatening to try and stop the adoption from taking place. I've lived in Malawi for the entire 27 years I have been on earth and luckily so, I have had a chance to live in families which I consider poorest and richest by Malawian standards. My simple opinion is that those who are opposing the adoption do not really understand what poverty is. Maybe they just read about it. Should Malawi say no to Madonna? Denying these children adoption is denying a chance to be given family and hope. Should the courts and insane Malawians oppose her second adoption, please give her my contacts... she can adopt me and my wife too!!! Oh dear. I'm sure she feels she has the best intentions, but you can't help feeling these are more than a little misplaced. Is a chaotic life traipsing the world being looked after by nannys, albeit in luxury, what this child really needs? Malawi does not approve adoption for single/divorced people, so why is Madonna any different? Yes she is raising awareness of the problem but the solution is not to send another child to live with a workaholic mum that relies on nannies, chefs, etc to care for her children. The child needs a normal environment with a loving family who will be able to spend time with them. Why not? Millions of African children live in absolute poverty. Here is a women who will provide a future for an orphan, not any orphan, but for an orphan living in the one of the most poorest of African countries. After all, what would you have dreamt if you were an orphan? I bet you would of wished for someone rich like Madonna to take you away from your everyday plight. At least someone's doing something! Stop judging her and worry about your own life. I think Madonna is doing a very selfless thing by wanting to adopt Mercy James. I highly doubt it's a publicity stunt. I think she decided to adopt Mercy so that David can have someone to relate to, I know he is receiving more than enough love from Rocco & Lourdes, but it will be nice to have a sister from his home country. I am based here in Lilongwe, and I can say that 98% of the people are in favour of her actions. Madonna, you're welcome in The Warm Heart of Africa any day! I think the Material Girl has shown the world that it's okay to be a user, materialist, and home breaker. If the Malawi authorities had any self-respect they should out of hand reject her request for adoption and find a better home for her for a better family, perhaps one with family values. I think it's great Madonna wants to adopt another child. No one human being, no matter how wealthy or famous, can solve all the children's problems but arguing that because there are larger issues you're not allowed to make a difference to one child's life is utterly ridiculous. I wonder at the motives of 'Save the Children' targeting Madonna like this and not Angelina Jolie for instance? I think what Madonna's done in both cases is a very selfish action. If she really had the best interests of David at heart, rather than her own, would it not have been better to sponsor his father to enable him to bring up his son? That way he could have remained with his family and in his own culture. Madonna is setting a dangerous precedent whereby anyone who has sufficient wealth can side-step the adoption laws of a country to achieve their own ends. 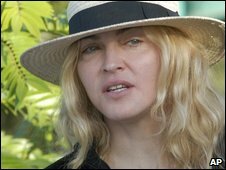 Why is Madonna being criticised so much? Critics from the UK ought to focus their attention on UK adoption policies/laws and ask the question, why does it take so long for children in care to be found homes? Why does it take so long for prospective parents to be approved? Hopefully Save the Children will consider answering this question honestly. I hope it will campaign on behalf of UK children in care and persuade government and all the agencies involved in UK adoptions, to make the process speedier, more efficient and succinct. Yes it would be great if all people could be adopted by extended family, but this is not always possible. Ultimately there is only one race, the human race. Cultures and differences need to be acknowledged (positively, encourage and develop links)within the wider family context. I think that if one sets foot in Malawi and see all the children that need a loving family, all the doubt will fade. Think of the children, everything else is just politics. Madonna has chosen her role and she should not be crucified for it. Ask yourself, "what are you willing to do for the children". Then do it.